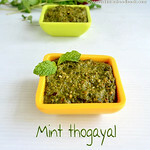 Coriander leaves thogayal/Thuvayal is favourite to all of us, especially my husband likes it very much. My mother-in-law is very good in making it. I can say thogayals are among the best of her recipes.The ratio of tamarind, red chillies and salt is very important to make perfect thogayal. Even if one goes high, we can’t get the exact flavor & taste. In our daily lunch, we definitely have any one of these thogayals. We mix this with plain rice and eat. 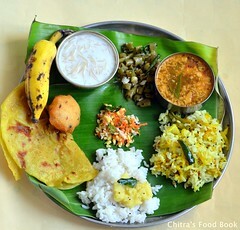 You can have this as a accompaniment for curd rice, all Tiffin items (idli, dosa, upma, pongal etc.) too. Even my two year old baby likes it :). 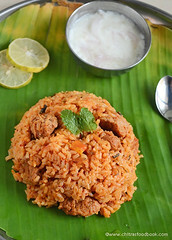 Also I pack this thogayal rice for my husband’s lunch which is his favourite lunch box recipe . We make thogayals with curry leaves, coriander leaves, mint, gongura, garlic, ridge gourd, brinjal ,gooseberry etc. 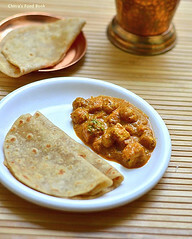 Here I have mentioned the recipe for coriander leaves thogayal with step by step pictures. Wash coriander leaves. Soak tamarind in little hot water. Heat a kadai with 2 tsp of oil and add red chillies, Urad dal. Roast it and keep it apart. Now grind red chillies, soaked tamarind with salt and jaggery (should be very less)without water.Then add the coriander leaves. Make it a paste adding little water. Use the soaked tamarind water to grind. Grind to a coarse or smooth paste as you wish. We make it slightly coarse. If you wish to store this thogayal for long time, proceed to next step else mix the thogayal with plain rice adding gingely oil/sesame oil/ nalla ennai and enjoy ! 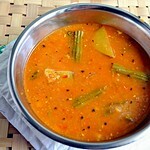 Now heat a kadai with some gingely oil ( 1 tbsp) and put the thogayal into it. The water content in it will be absorbed and it thickens. Just mix it for a minute. Store in a box after it cools down. It can be refrigerated and kept for 10 days. This step is purely optional. U can enjoy this thogayal without sauting in oil. But shelf life will be reduced to 3 days. Delicious coriander leaves thogayal is ready to be served hot with rice. Enjoy!! Milk halwa / Paal halwa in Tamil / Doodh is the first sweet which got me a good name from my Hubby dear, my in-laws & relatives. So I decided to have this as my first post. 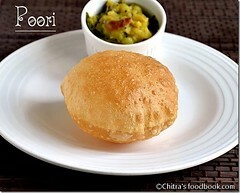 I must thank my friend Shalini for teaching me this yummy recipe. This halwa is very easy to make and tastes very rich. 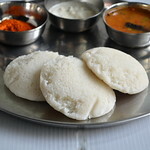 It is different from milk kesari in ratio, method of preparation as well as taste. It tastes similar to paal khova. 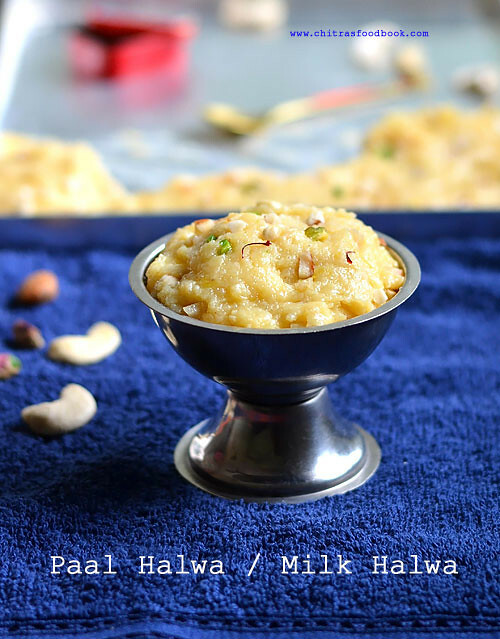 Recently I tasted milk halwa from a sweet shop and modified the recipe slightly to get grainy consistency. Do try it and let me know your feedback. 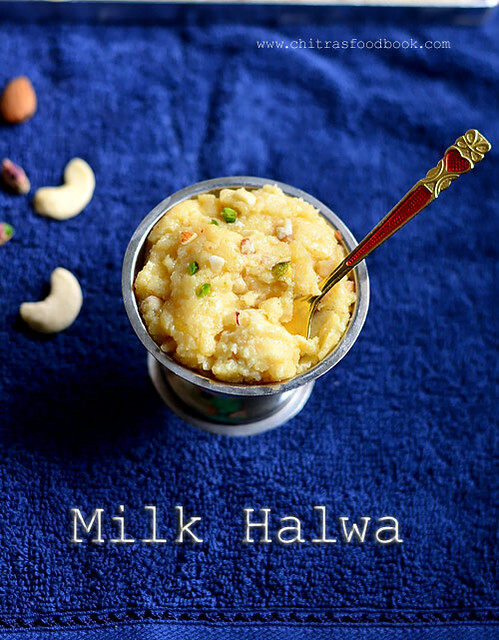 Lets see how to make milk halwa using simple ingredients & method with step by step photos ! Fry the cashew with a tsp of ghee and keep it aside. 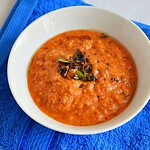 Take the unboiled (raw) milk in a heavy bottomed kadai & add all the items into it except cashew & cardamom powder. Check for sugar and add more if necessary or else add milk if sugar is more. No problem about the ratio of rava/sooji. It should be minimum. Keep it on the flame, Stir the mixture slowly till it reduces to half. But make sure u stir it at regular intervals to avoid lumps and sticking. Once it becomes thick ,simmer the flame, add the cardamom powder & curd (if using) and stir it continuously. At one stage it will become non-sticky and it starts leaving the sides with some traces of ghee. Switch off the flame immediately. Grease the plate with little ghee and spread the halwa into it. Decorate with fried cashew nuts and enjoy !! It will set as it cools down.Milk halwa is ready to serve hot. It stays good only for ONE DAY without refrigeration. Use thick, full fat milk for rich taste. For flavoring u can add saffron or vanilla essence instead of cardamom. 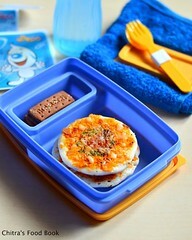 U can try this recipe in microwave oven too.For 700w , keep it for 20 mins & stir for every 3-4 minutes. Here I have mentioned 1 cup of sugar. But I used little less than 1 cup (may be 2 tsp less).So depending upon the sweetness you need,increase the quantity of sugar. Food Color is not necessary. If u need, u can dissolve saffron in little hot milk and add it. Sooji is used to give thickness to the halwa. Do not stir the halwa for long time,it will become chewy.So remove it as soon as it starts to leave the sides of pan and looks thick. It will set only after it cools down completely. 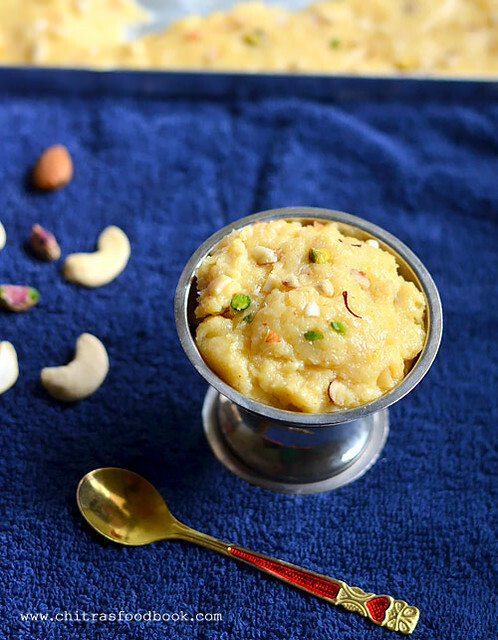 Enjoy this yummy, creamy halwa at home ! Kids would love it for sure !! 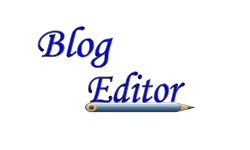 I am very happy to start my food blog on this great new year day and be one among u.
I thank my Sister-in-law from whom I came to know about these food blogs. I regularly visit Srivalli’s cooking4allseasons and I have participated in one of the events conducted by her as a non-blogger. She published my recipe and encouraged me to start my own. I take this opportunity to thank her for the encouragement. I admire her wonderful blog and all the events conducted so far.When I told this to my husband Sendhil, he initiated me to start this blog, chose the title and framed this intro post too;). “WISH U ALL A VERY HAPPY AND PROSPEROUS NEW YEAR"